Deployment: NASA has asked for a fresh look at using inflatable ballutes for aerocapturing around Earth spacecraft from the Moon. BOULDER, Colo. -- Moviegoers may recall it as that nifty bit of high-speed technology used in 2010: The Year We Make Contact -- the space age equivalent of playing air bag bumper car with Jupiter. 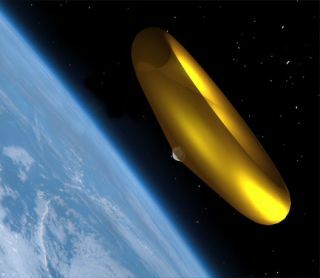 A "ballute" was used to slow the spacecraft once it reached the giant planet, a device that allows for aerocapture around a celestial body that's enveloped in an atmosphere. Now fast forward two decades since that sci-fi movie's release in 1984. NASA's Exploration Systems Mission Directorate is on the lookout for new concepts for its Vision for Space Exploration -- the White House-backed Moon, Mars and beyond agenda. And on November 16th, NASA selected a concept from Ball Aerospace & Technologies Corporation for inflatable thin-film ballutes for return from the Moon. Not only Moon-to-Earth traffic could benefit by using the ballute/aerocapture technique. So too could missions to Mars, as well as future probes to Titan, the largest moon of Saturn, and other distant destinations. Aerocapture uses atmospheric drag to slow down an incoming satellite so that it enters an orbit around a planetary body more efficiently. Taking this approach translates to using less propellant to slip a satellite into a proper orbit, lower launch costs, and makes more room on spacecraft for sensors and other payload gear. By using a ballute -- a fusion word from balloon and parachute -- a spacecraft can slow down enough to go into orbit around the target planet. "We call this concept 'fly higher, fly lighter', said Kevin Miller, Senior Technical Manager of Spacecraft Systems in the Civil Space Systems division of Ball Aerospace here. The idea is to use a large ballute that flies high in the atmosphere and decelerates itself and the attached payload over a period of time. That high-flying maneuver would reduce heating loads on the ballute. "The temperature on the ballute does get hot, but it's within the limits of thin film materials," said Jim Masciarelli, Principal Engineer for Spacecraft Systems at the company. You pick a point in the atmosphere, but not so deep that the ballute sees high heating rates, he said. Given a ballute-enabled aerocapture, a payload could be released to drop into a pre-selected landing zone, touching down on Earth via parachute or parafoil. Using this technique to put an incoming payload into an orbit for retrieval is feasible too. The ballute's lightweight "fabric" comes from the high-temperature, flexible polymeric film family that includes kapton, Miller told SPACE.com. No need for the type of thermal protection system like that in use on the space shuttle or akin to an incoming Apollo lunar mission of the past. Masciarelli noted that thin film materials technology has advanced over the years, as has the manufacturing of large inflatable structures, high-temperature adhesives, and analytical design tools. "Obstacles in the past...now the obstacles are not quite so big," he explained. There are several ballute bonuses: For one, you don't have to confine everything inside a fixed space of an aeroshell or heatshield. Furthermore, it doesn't really matter what payload is being toted. The ballute technology is viewed as modular and scaleable, Masciarelli pointed out. Ball Aerospace is working on the ballute concept along with other team members, including NASA's Langley Research Center, Georgia Tech, and ILC Dover. The newly won contract has a total value of $14.12 million. Now scripted is a four-year, step-by-step test program. Materials and different assembly methods are to be studied. What shape is the right shape, and what ballute size ranges are required will be assessed. Test ballutes of roughly 10 feet (3 meters) in diameter will be fabricated, evaluated in vibration facilities, a large wind tunnel, and vacuum chamber. Similarly, small scale models are to be tested in hypersonic wind tunnels. Eventually, in-space demonstration of large inflatable ballutes seems to be mandatory, Miller said, to show the idea is ready for prime time. In adopting new technology to space projects there is always "institutional hesitation", he said. "You've got to walk before you fly," Masciarelli said. The ballute concept can apply to a small science package, large cargo, made-on-the Moon propellants, or human-carrying spacecraft such as NASA's Crew Exploration Vehicle (CEV) -- all hardware that would be on a heading from the Moon to Earth, Masciarelli said. In addition, the ballute concept could operate all the way from a terra firma launch pad to Earth orbit, Masciarelli continued, permitting an astronaut to climb inside the inflatable device and escape from the space station or a damaged space shuttle. That idea is not new. In the 1960's, General Electric was exploring a similar notion under a program that was later shelved: Man Out Of Space, Easiest - or MOOSE. "First things are Moon and Mars," Miller said, with the ballute idea permitting a very high performance return from the Moon, but also serves as enabling technology for getting people to Mars. "The 'and beyond' is coming," he said.